The main welcome space (Literascooters on the right). Photo by Tim Benson. It only just occurred to us that featuring a public library in a project profile and calling it a cutting edge “shared workspace for bookworms” would have been a sneaky/cute April Fools’ Day post. Also, we think we too often overlook libraries as excellent examples of collaborative — and perhaps even more importantly, quiet — open workspaces. But we digress. The Chicago Literacy Alliance — an association of over 80 agencies operating in and around the city to help meet literacy needs for people of all ages and backgrounds — reached out to us recently to share their new space, the Literacenter. The literature-themed decor is what really got us — conference rooms are named after books (“Ethan Froom” and “Roomeo and Juliet”) — and the scooters(!) the center has provided for members to get around the space are named for characters and authors, for example, “Scoot Finch” and “F. Scoot Fitzgerald”. Who could resist? We reached out to Stacy Ratner, co-founder and creative director of the Chicago Literacy Alliance, to hear more. A few of the book themed meeting rooms (Roomeo And Juliet, Ethan Froom, and The Catcher In The Room). Photo by Tim Benson. What role did you play in the project? Starting from the idea of a shared nonprofit workspace for literacy organizations in 2012, I put together a team of brokers, architects, and space planners to help turn it into a reality, and worked with them at every stage of the process to make it happen. Open flex space between the big meeting rooms. Photo by Tim Benson. Total employees of the CLA: eight. Daily population of the space (including all shared member use, average events, etc. ): 200. The mission wall and flex space. Photo by Tim Benson. CLA employees are here full-time. Resident members here every day account for another 70 or so people. Shared space members vary their use. One block from the El (subway), two blocks from the Metra (commuter train), one block from two bus routes, adjacent to a Divvy bike station, one block from a lot containing Zipcars, and three blocks from the most densely restauranted street in Chicago (Randolph). Entry stair with “up” themed book stairs and a hand-painted, book themed mural. Photo by Tim Benson. All furniture came from Rightsize Facility Performance and is a mix of lines and products. By reusing many pieces from other clients and choosing finishes that worked across the space, they helped us kit out the entire space at a budget that worked with our nonprofit limits. Literacenter is the country’s first shared nonprofit workspace dedicated to literacy, so books and reading are reflected everywhere. All our meeting rooms are named after books (The Catcher In The Room, Roombinson Crusoe, etc.) and have doors wrapped to look like book covers. The main staircase has each stair covered to look like a book spine. The columns in the main welcome area are topped with mini-shelves and rainbow books. Five Literascooters named for characters and authors (Scoot Finch, F. Scoot Fitzgerald, etc.) help people get around. Even the bathrooms are in on the joke: the walls and doors are covered in magnetic letters and poetry words to enable writing everywhere. These book spine stairs connect the main spaces. Photo by Tim Benson. For our members, the most unique feature of the space is its overall high quality. As nonprofits, many of our members are used to dealing with substandard facilities, tight space, secondhand furniture, and other economies necessitated by their small budgets and need to spend mostly on programs. Having 16 state-of-the-art meeting rooms, a professionally designed environment, and all the other amenities here has been not only unique but completely transformative for members. Sixteen of our member organizations have dedicated space here. For some, the hardest part of change was moving away from clients in their old locations. For others, it was taking less (but better) space than they previously occupied. The LitLounge social space is for member fun (foosball, kitchens, board game library, etc.). Photo by Tim Benson. The vision of the Literacenter was to make a space that would foster collaboration among literacy organizations, and it’s working! Groups that didn’t know each other before now regularly share tables in the open areas and team up on projects. The meeting rooms are booked most days for retreats, board meetings, programs, and introductions, and the main LitLounge social space has member-generated events (movie nights, art shows) every week. The Literacenter is a great shared workspace, and we get a lot of requests from outside groups to rent it for meetings, parties, and events (which we happily accommodate on a rental basis to help fund our work). But the most important thing about it, and what we hope others learn, is that sharing space is transformative not just for working environment, but for powering social change. 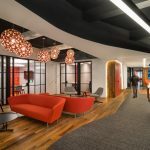 Check out pics of fast-growing tech company Solebrity’s new Ashburn, Va. office.